2010 Chain Reaction audited financials here. 2010 Wiggle audited financials here. In 2010 Chain Reaction did $173 million in global sales and earned $15 million. Wiggle did $137 million with $10.5 million in earnings. If not expertise, I can at least bring some experience to the subject: Those are big numbers, and each business reached those heights at a pretty astonishing rate. Props to both for their success. It’s anyone’s guess how much of Chain Reaction’s 37% of non-EU sales are to American customers. Our belief here is that it’s likely at least half. If the same holds for Wiggle, that adds up to nearly $40 million in US exports per year. 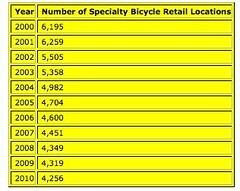 Given that the NBDA approximates that the size of the specialty retail bike business in the US is $2.4 billion, one might think this $40 million is a mere rounding error. But there’s a twist: This $40 million was spent on high-end Shimano, Sidi, Continental, Vittoria, and countless other primo brands, the very sort of marquee goods purchased by American IBD’s highest-value customers. What is the UK online retailers’ value proposition? Because they’re based in Europe, Chain Reaction and Wiggle have the advantage of buying their goods directly from manufacturers. They then leverage their savings by selling the goods in foreign markets such as the US where distributors and importers normally add a layer of markup. Because of this, the retail prices at Chain Reaction and Wiggle are upwards of 30 to 40 percent less than what you’ll find in American retail stores — whether it’s your local bike shop, or at Competitive Cyclist. Whenever we ask manufacturers why they don’t have global pricing parity, they plead the same case: They’d love nothing more, but they have no enforcement mechanisms. They claim that the EU has strict anti-trust regulations that prevents them from regulating MSRP or Minimum Advertised Price (MAP) and from punishing a retailer for violating pricing guidelines. ‘Price Maintenance’ laws in the EU are purportedly far less friendly to manufacturers than in the US, where a single advertisement for a product at sub-MAP pricing gives a manufacturer full legal right to cut off a retailer’s supply of goods with no notice. In studying these financials, I kept thinking that Chain Reaction and Wiggle aren’t winning in the high-end US marketplace because of a strategy. They’re winning by exploiting a market anomaly. Exploitation is not a strategy. The only party capable of reversing this situation is the manufacturers who supply them their inventory. If manufacturers don’t shut down this UK-USA sales channel, they’re the ones that ultimately stand to lose the most. Why? Manufacturers who’ve already made global pricing parity a priority — including Specialized, Trek, Cannondale, and SRAM — will rapidly gain mindshare and marketshare as retailers recognize that stable pricing is a brand asset as powerful as high-zoot technology and top-dollar marketing. One sidenote: Some folks will read these observations and predictably assert that the price differential between Chain Reaction and the American IBD is analogous to the pricing advantage Competitive Cyclist enjoys over the IBD because we don’t charge sales tax. But that’s incorrect for three reasons: First is the cause of the disparity itself: We don’t charge sales tax because sales tax rules are a function of federal law. Chain Reaction charges 33 percent less for Continental tires because Continental doesn’t manage its pricing. There’s a big difference between congressional legislation and manufacturer inattention. Second is the degree of the price differential. American retail pricing on a pair of Look’s fabulous Keo 2 Max pedals is $180. Chain Reaction charges $104 for a set. A 70 percent discount is far more motivating than the sub-10 percent savings that comes from sales tax avoidance. Furthermore, our shipping charges offset the sales tax savings, making the bottom line cost of almost everything we sell at Competitive Cyclist identical to what you pay when you buy it at the IBD. Lastly, it’s all-too-obvious that someday all online purchases will be taxed. The government loves its tax revenue, and government budgets are in a dire need of revenue. Internet sales tax is inevitability. But decisive action from bike manufacturers to create pricing parity will require a focus and discipline they don’t always show. To call it a probability, let alone an inevitability, would be far too optimistic. 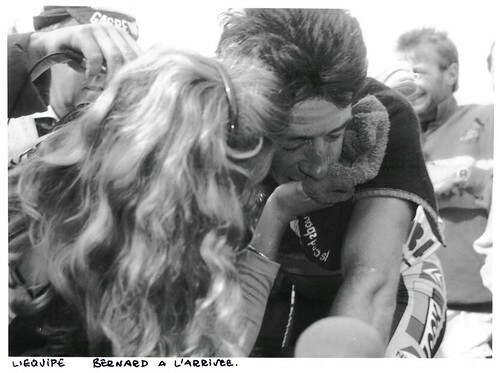 Speaking of Jean-Francois Bernard, sometime in the last 5 years or so there was an article in the print edition of Pro Cycling or Cycle Sport about his transformation into a gourmand. I can’t find it online anywhere, but I’d love to re-read it. Does anyone have a copy? – ‘I keep thinking of Russia, Russia…’ It’s more than just an essential punk rock lyric — it’s reality for those of us addicted to pro cycling fanhood. The Kolobnev saga is a laugh riot. Somehow he tested positive at the Tour but he’s already been cleared and training for the 2012 season. Denis Menchov — seemingly lost for good after a two-year journey through dopage allegations and the darkness known as Geox — is close to signing with Katusha. And is any mien in the peloton more intimidating than Sergei Ivanov’s? Whenever I see news about the Russians I think back to my fave Russian PRO of all time, Darius Kasparaitis. He is the archetypal Russian professional athlete: Near-homicidal rage in his eyes with a brutal way of playing the game. – We won’t ban any words this week, but one is damn close: Swagger. Its use was simmering through the summer. With the onset of football season in late August it blew up everywhere. If you read the sports pages, you’ll find that its ubiquity was only matched by the late-90’s use of the phase ‘Shock The World’ during NCAA basketball tournament time. 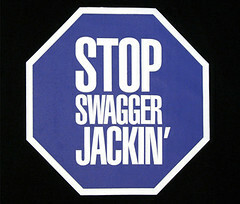 No cliché is worse than a sports cliché, and swagger wins the prize in 2011. The ban nomination is here, and the final vote is only days away. Perhaps once it’s worn out completely, its use will be replaced by ‘moxie’, though that somehow seems a touch feminine. – Best $25 you’ll spend on winter training: The Smartwool Neck Gaiter. Only $25, but versatile enough to serve as neck-warmer, neck-and-ear-warmer, or near-equivalent-to-a-balaclava. The wool fabric has enough tension to stay in place no matter where you stretch it around your head. But it’s soft and itch-free. And no matter how much you stretch it, one wash (yes, it’s machine-washable) gets it back to its original shape. Cycling jackets and long-sleeve jerseys don’t do your neck justice. The Smartwool Neck Gaiter is the cure.